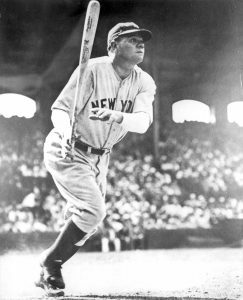 George Herman “Babe” Ruth (February 6, 1895 – August 16, 1948) was an American professional Major League Baseball (MLB) player. His career spanned 22 seasons, from 1914 through 1935. He started out as a gifted left-handed pitcher for the Boston Red Sox and went on to achieve his greatest fame as a slugging outfielder for the New York Yankees. But before his stellar career in baseball began, Ruth was a youth in foster care. Ruth was born in 1895 in Pigtown, a working-class section of Baltimore, Maryland, named for its meat-packing plants. His father, George Herman Ruth, Sr. had a series of jobs, including lightning rod salesman and streetcar operator, before becoming a counterman in a family-owned combination grocery and saloon. As a young child, Ruth was drinking beer, running in the streets and rarely attended school. After a violent incident at his father’s saloon, the authorities decided that environment was unsuitable for a small child and he was removed from his parent’s care. At the age of 7, Babe Ruth was sent to St. Mary’s Industrial School for Boys, a reformatory and orphanage, where he stayed until he was 19. It was there that he learned life lessons and baseball skills from Brother Matthias Boutlier, the school’s disciplinarian and a skilled baseball player. The older man became a mentor to Ruth and for the rest of his life, Ruth would praise Brother Matthias, and his running and hitting styles closely resembled his teacher’s. In 1936, Ruth was elected into the Baseball Hall of Fame as one of its “first five” inaugural members. Today, Babe Ruth is regarded as one of the greatest sports heroes in American culture and is considered by many to be the greatest baseball player of all time. There are nearly 3,000 children in foster care in Miami-Dade County. Perhaps there is a Babe Ruth among them. Help us bring out the full potential in every foster child. Be A Voice by donating to their dreams!